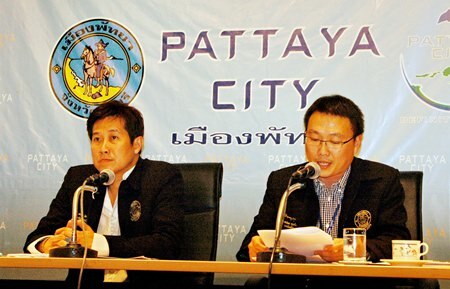 City officials officially have launched the “Pattaya City Guide,” an online and service allowing visitors to search and obtain information on more than 2,000 hotels, restaurants and tourist attractions. Comprised of both a website and smartphone application, City Guide provides maps, photos and information; lets users search for information on venue by pointing a camera phone at it; and plan routes to various destinations. Both the website at www.pattaya.go.th and app are free. The app, designed for both iOS and Android, can be downloaded on the Apple App Store and Google Play. 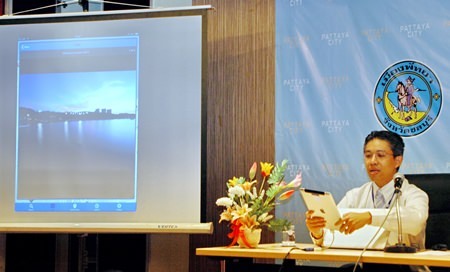 Project director Theeradet Juladung demonstrates the geo-informatics of Pattaya City Guide. The app tracks the user’s location and places pictures – and advertisements – on the map corresponding to the current position, he said. Project director Theeradet Juladung said one innovative feature of the app employs “augmented reality” that allows users to see information about a tourist venue overlaid on the screen of the phone’s camera. About 2,000 venues have been added to the system since it went online in October. Now that the guide officially is open, officials are encouraging the public to register a free account on the website and add photos and information on their business or service. Currently, both the website and app support only English and Thai, but more languages are planned. Since its launch Oct. 1, the iOS app has seen four updates.